Following the successful launch of its wearables line in fall 2015, Fossil unveils its newest Q addition—slim hybrid smartwatches—along with colorful and unique new designs to the existing hybrid smartwatch collection. Fossil is presenting the new products and features at CES 2017 in Las Vegas. 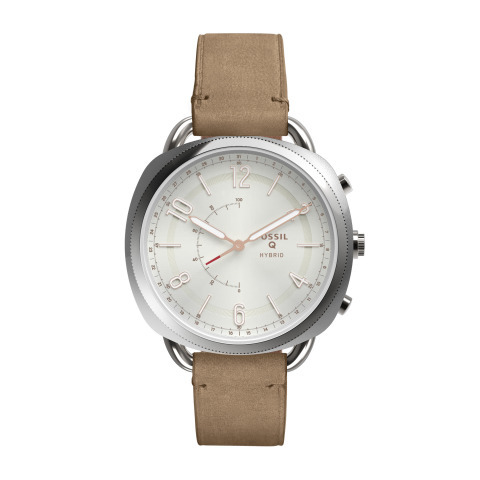 Fossil Q is a line of fashionable wearables showcasing the design excellence, expert craftsmanship and bit of whimsy that defines Fossil. With the addition of Q Modern Pursuit, Q Grant, and Q Accomplice the line now includes three types of wearables: display smartwatches powered by Android Wear™, hybrid smartwatches, and activity trackers. Q Accomplice, as suggested by its namesake, is the perfect companion for life’s many adventures. This newly launched smartwatch is the slimmest designed Fossil Q hybrid case to date. The watch’s slim case body, unassuming updated face details, and delicate design details highlight our watch designers’ goal to create the most functionally beautiful and elevated hybrid smartwatch. Supporting up to three customizable pushers, the new hybrid module replaces the mode selector sub-eye, for an always-on connected gauge that can be tailored to the user’s specifications. Pushers can be fully customized through the Fossil Q App to work with an ever-expanding assortment of features to curate the experience that best suits the individual user needs. Haptic motors and hands work together for notifications and feedback for this no-charge battery powered smartwatch. The Q Modern Pursuit and Q Grant are extensions to the current line of hybrid smartwatches that blend analog design with smart connectivity. Q Modern Pursuit features bold colors and graphic iconography that allow for quick glances for easy reminders of texts, emails, and social media notifications. Thoughtful design details like analog sport hands with slim tips and silicone straps make this sport (vintage) watch an ideal companion for an active lifestyle. Inspired by the classic appeal of vintage timepieces, the Q Grant is a simple analog design that blends traditional watchmaking with contemporary functionality. Watch hands have a highlighted red pointer for easy readability making it the perfect discreet tech companion for any activity and personal style. All hybrid smartwatches will continue to include features such as activity tracking, date, alarm and notifications for calls, texts, emails, and calendar events. These new styles will be available in stores in spring 2017 and retail between $175-$215. The entire line of Fossil Q wearables is compatible with Android™ 4.4 and higher, iPhone 5 and above (running iOS 8.2 and higher), and connects via Bluetooth technology.